Celulose, Modified Cellulose Gum, Stearic Acid, Silica. Take one capsule three times daily with water.Use a full 8 oz. glass of water or other liquid. Cellulose, modified cellulose gum, stearic acid, silica. Take one tablet three times daily with 8 oz. glass of water or other liquid. Providing natural support for your urinary tract, Nature's Way Cranberry extract concentrates the power of cranberries into convenient vegetarian capsules. Cranberries help prevent and fight urinary tract infections by helping prevent bacteria from attaching to the bladder. This includes hindering infection by dangerous E. coli bacteria. 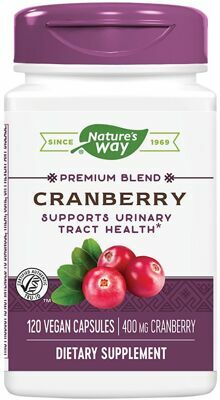 To boost the effectiveness of Cranberry Extract, Nature's Way also includes Ester-C, an absorbant form of vitamin C. Protect your urinary tract from painful infection naturally with Nature's Way Cranberry Extract. Nature's Way Cranberry Extract is standardized to 400 mg concentrated juice. It helps maintain a healthy urinary tract by inhibiting the adhesion of E. coli bacteria to the lining of the bladder. * Also contains 100% USRDA for vitamin C.
Other Ingredients: Celulose, Modified Cellulose Gum, Stearic Acid, Silica.